Whether you’re single or attached, Valentine’s Day is kind of the worst. For the single, it’s a quiet kind of pity party, a big fat reminder of singledom (and what’s so bad about that, anyway? ), and for the coupled, it’s a day of weirdly forced romanticism – diamond commercials (gag), expectations (flowers, at least), cheesy fixed price menus (molten lava cakes!) and exorbitant prices all around. Ugh. And yet. I do love an excuse to bust out the heart-shaped cutter. 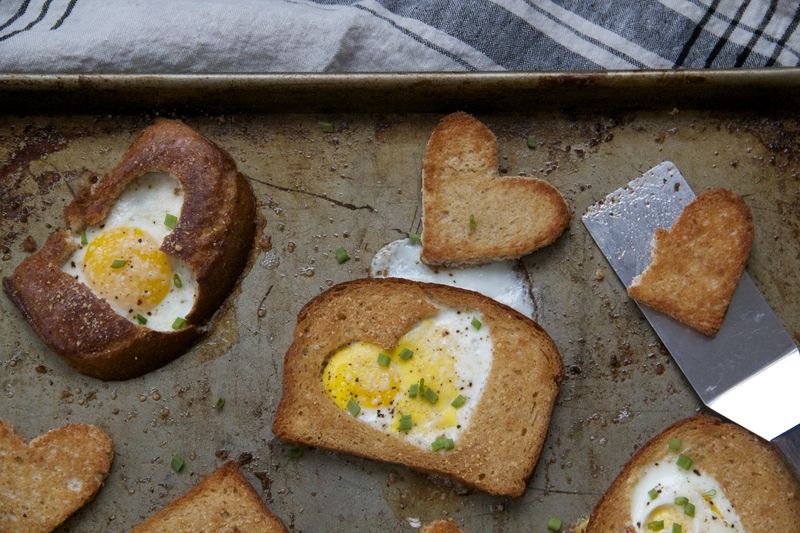 Like a heart-shaped, egg-filled piece of toast! Or four. On a sheetpan! Obviously. The nice thing about these is that they all cook at once in your oven, so if you’re hosting a Valentine’s Day brunch or have a bunch of kiddos to feed, you don’t have to stand over the stove and make these one by one. But if they’re not your thing, you could always just go with chocolate. Or cookies. Or pizza! 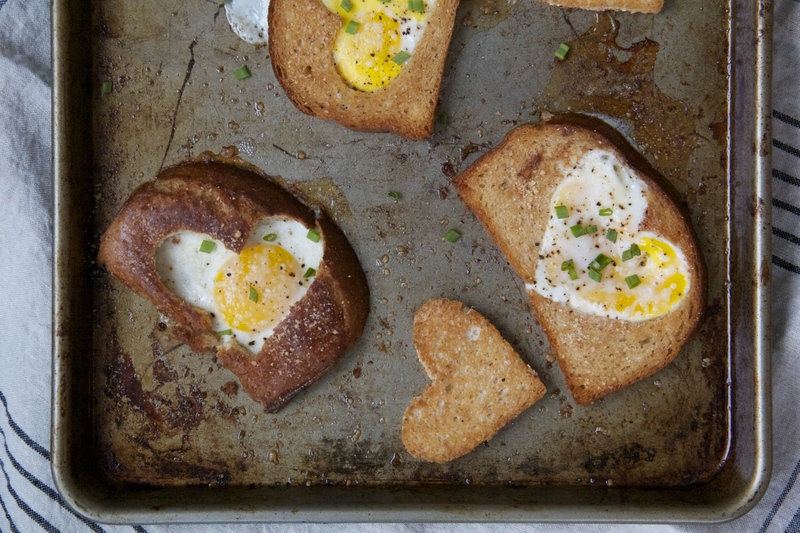 But you know what they say… every kiss begins with Eggs in Hearts in Breads. Or something. Only barely adapted (halved, basically) from Sheet Pan Suppers! Recipe can be easily doubled (to feed 8). Preheat the oven to 350°F with a rack in the center position. Place the butter on a sheet pan and put the pan in the oven until the butter melts and begins to bubble, about 5 minutes. 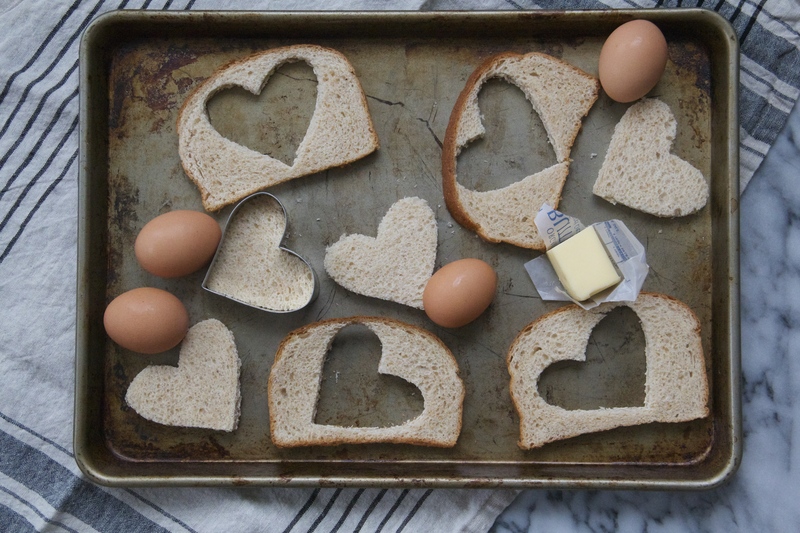 While the butter is melting, use a heart-shaped cutter to cut a hole in the middle of each slice of bread. Save the heart holes! Remove the pan from the oven; the pan will be very hot. Carefully dip the bread slices in the melted butter, turning each one to coat both sides. Arrange the bread in a single layer in the pan. Do the same with the heart holes, placing them around the bigger pieces on the pan. Bake the bread until the bottoms are toasty, about 10 minutes. Carefully remove the hot pan from the oven and flip each piece of bread and each heart so the toasted side is up. Crack an egg into the hole in each slice of bread, and sprinkle the eggs with a good pinch each of salt and pepper, the grated Parm, and about half of the fresh herbs. Return the pan to the oven and bake until the whites of the eggs have just set but the yolks are still runny, about 10 minutes. Serve hot from the oven, sprinkled with remaining herbs, with the toasted hearts, which are great for dipping into warm egg yolks, alongside. Valentines Day is the worst. 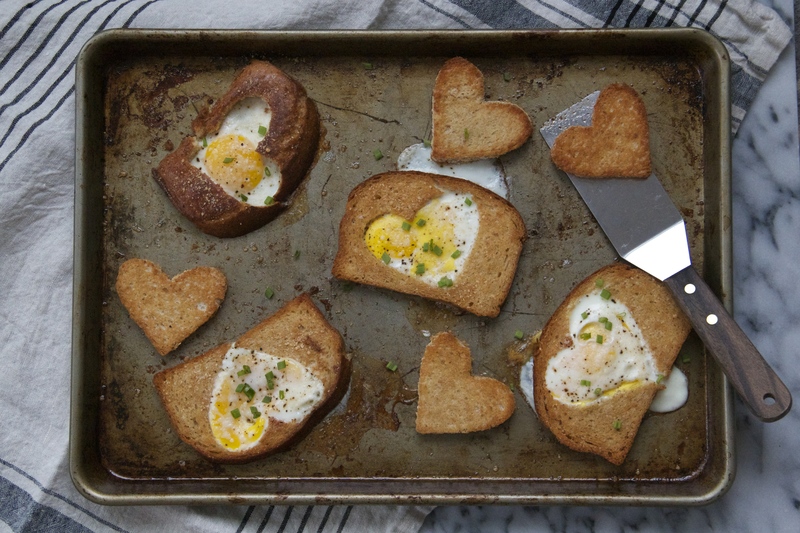 Eggs in hearts in bread are the not-worst! I second Maggie’s comment !!! LOVE you, Chef Molly! Love that these are baked! We call these “bullseyes” and they are tough to flip in the skillet..problem solved! Thanks! Molly, do you use room temp eggs for this or will the timings work if the eggs are refrigerator-cold? Hi Bonnie! Eggs from the refrigerator work just fine here. Thanks! I grew up on eggs-in-holes-in-bread, in Boston, made in a big frying pan, with Italian “Scali” bread. Scali is a local thing in Boston, a soft-bake Italian white bread with asesame seed top. It’s a good substitute for Challah, but less rich. There’s a scene in the movie “Moonstruck”, a total winner, where the Italian mother (Olympia Dukakis) is making these eggs in bread for the family breakfast. So classic, I teared up. I think the oven method is better than the frying pan method, regardless of how/where I was raised. I just made these…came out PERFECT!